Gas giant formation has finally been explained by the pebble accretion model. Scientists at the Southwest Research Institute have come up with new explanations related to gas giant formation and the pebble accretion theory. 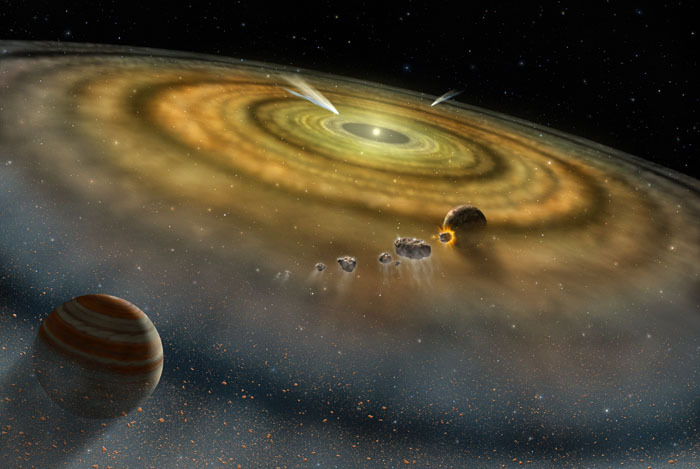 In their opinion, the new model should replace the previous Solar System formation theories as the latter do not account for many of the questions that researchers still have. Gas giant formation was first explained through the core accretion model which stated, in a nutshell, that massive planets like Jupiter and Saturn formed by gathering debris at their center. While this model has served scientists’ interest for many years, it still failed to answer the main questions tormenting all NASA researchers, namely, how did massive gas planets form? After many experiments and computer-generated simulations a new theory has taken form. Scientists have noticed, based on the researchers they have made that the cores of the planets had to be ten times the size of the Earth in order to allow Jupiter and Saturn to arrive at the dimensions they have today in such a short period of time. For that matter, they have replaced the core accretion model with the pebble accretion one. According to this theory, the core of these gas planets was initially formed from tiny ice pebbles the size of a foot. Coupled with the gravitational power surrounding these planets, these pebbles have gathered increasingly more material until they eventually became the massive celestial bodies we know them today. However, the various tests that have been made have had different results. When performed at faster speed, experiments have proven that pebbles did not evolve into gas planets, but rather into icy Earths. As a result, they assumed that the cores of gas giants revolved around itself at lower speeds compared to their gravitational fields, thus preventing materials and debris from being sucked in by other planets. Additional tests have revealed that, indeed, the foot-wide cores of gas giants were formed at a much lower speed than it was initially believed. Simulations have given researchers the possibility to recreate two gas giants the size of Jupiter and Saturn, two ice giants like Neptune and Uranus and one Kuiper Belt-like formation. Thanks to the new finding, researchers have many more leads when it comes to explaining the formation of certain celestial bodies.